Download Deep Meta from their site. You can take your time prepping images that way, but very likely that you will get the same inspector for your batch. I'm in the tiny minority of those who don't find it infinitely useful for uploading; I just think it's an extra step in the process, (admittedly, it can save your mental equilibrium if you get logged out as you finally confirm all your keywords and categories) but it has other uses too. You can set DeepMeta to upload a batch with intervals between each file if you want - that way, you're less likely to get the whole lot going to the same inspector. Yep and it is a slippery slope. If the inspector likes your stuff most will get accepted. If he doesn't (like in one of my cases) he/she rejects. So it's really up to you if you think spreading the risk is better for acceptance. I am now about 85% acceptance using Deep Meta, the ones rejected are usually stupid keyword disparities or complete disagreements on the rejection reason, in which case I'll Scout. If Scout comes back and says they agree with the inspector I generally move on unless I think the image is special enough to make it in (there's been a few times I fought and now they are flamers:)). I was formerly one at a time, then add all the data that was missing and make corrections, online. That included, keywords, categories and editorial captions. Once I started using DeepMetea I found it was much easier to upload and send batches of files. The extra step, removes the step of doing all the same online, so for me it was much easier and faster. So it's actually easier and shows the catagoeies and alternate keywords, better than the online version. Have you tried deepmeta in the last month? It shows all the keywords, has faster catagory navigation and saves me time? What do you find an "extra step" when everything is done and all you do it hit upload? There used to be a defect with istock's servers that I encountered last year that sometimes sees all the model releases get dumped. Not sure if it's still there as I haven't uploaded for quite a while. For me, the ability to attach multiple releases to a single image was the main reason to use deep meta, as it cut out the need to create your own stitched release file. 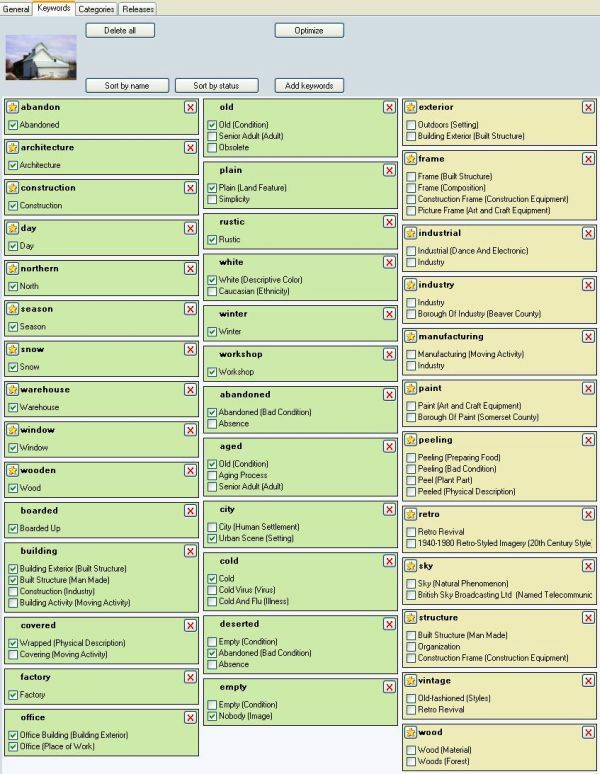 I don't tend to do the kind of batches that have common keywords, so doing it in DM adds at least the extra steps of getting the photo into DM; but in fact, it always seems to take me much longer to input and DA all the keywords into DM than it does directly into iS. I'm aware that might be perception rather than reality, but as I don't have a stopwatch, that's moot. LOL yes I know about perception. I find I spend much less time here, than I think I do. Or wait, is it the other way around? Here's the part I like about CV and disambiguation: Much easier to see them all and the choices without the + and drop down menus. I like it. Green is completed, Yellow needs attention. Same for categories. Easy, click, click, done. I add my keywords in advance using a couple of things and finally BreezeBrowser Pro to set it XMP and legacy IPTC so it's readable on pretty much every site, no matter where they find the data. Makes life easier all around, one standard. For editorial online works better because I can see the image date and get the Caption right. Might just be me? But it's odd how DeepMeta drops everything after a ":" in the Caption and Editorial requires it. Should someone tell them? I upload my photos and keyword /DA them in iStock. You do the keywords in Bridge and/or Lightroom or ... ("a couple of things"), tweak them in BreezeBrowserPro, then upload them into DM, then DA them and choose categories within DM, then upload them to iStock. And you think your way is better? We'll have to agree to differ on this one. What I'd really, really like to know is why iStock strips out the IPTC Core/copyright information. That's surely just a gift of an orphan file to the world. Whether I use a couple of things, like keyword software and add them online or do it ahead of time, has nothing to do with using DeepMeta, that was the point. DeepMeta makes the categories easier and the disambiguation easier. I would do my keywords the same if I wasn't using DeepMeta because when I upload to any other site, they are all there. Maybe that's part of it. So actually I'm removing a step by batch uploading, instead of one at a time. I'm removing clicks by having all the sub words, visible from the start. ANd I can also pick the catagories before I upload. I might add that editing older files and adding or changing keywords, is much easier with DeepMeta? That's about four things that are easier. But part of that, which maybe I didn't explain is I do the metadata on files, offline, in advance, not online. That's my own choice. So do you use some software for creating keywords and lists of suggested words? That's why the "other" and BreezeBrowser, which creates data that every site can read. That may have changed but some places when people upload, the keywords are lost or jumbled. I don't want to manually type in the words, one by one online? Did I mis-understand how you do that?